This short piece is written without reproductions of Danielle Wepener’s work at hand and acknowledges that in the weeks leading up to her final exhibition, further developments to her project will take place. So much of what follows is written in relation to my own reconstructions of studio visits, of crit sessions in various parts of the Wits School of Arts building and, finally, of those moments of publication such as the June and November exam assessments and Martienssen Prize exhibitions. As such, this essay is perhaps as much a reflection on a collective pedagogical map from the last two years as it is a reflection on a body of work. The first two years of the BA Fine Arts degree at the Wits School of Arts offer a range of opportunities for students to engage in projects that begin to allow an understanding of what contemporary art practices might, or might not, be, and what they might, or might not, do. On at least two occasions during this time, students “paint”, and it is the second year painting project that marks my first memory of Wepener’s work. Early in the third year of her degree studies I remember discussing her plans for the self-initiated project that would be pursued in the coming months. Part of this conversation involved a reviewing of works from the first and second year programmes. I recall a painting, or parts of a painting, she had grappled with in a second year project set by Professor Penny Siopis. I write “parts of” specifically because, if a recall correctly, the task involved working from fragments of photographs torn from magazines and newspapers. 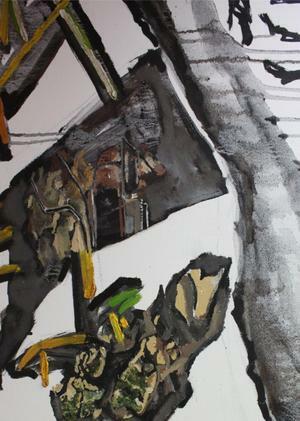 Wepener showed me a large canvas with a series of painterly conglomerates occupying different parts of the surface. I don’t recall what these painterly conglomerates referenced in a literal sense – and perhaps this is exactly the point. In this early project Wepener began to understand the potential for what painting might be. Whether she realised it or not, in my mind, this is where her own project began; a project that has continued through until her fourth year show, and, I am sure, will continue for some time to come. Part of this project is a scrutinising of what painting might be in this contemporary moment and a growing confidence in asking what it means to paint. The third year body of work produced by Wepener had its origins in a family owned factory where gates and fences are manufactured. The machines, products and interior spaces of this factory were constantly present in these works, some small, others much larger. Human presences were more fleeting, less insistent. At times confident and at others more tentative, it was in these works that the gate motif became something that invited a longer term project. At this point I digress slightly from this particular route on the pedagogical map and intersect with another. Parallel to the project for her Fine Arts III course, Wepener worked with lecturer Natasha Christopher and visiting artists Ryan Arenson and Nandipha Mntambo in the Design and Drawing III programme. Here she produced works which demonstrated a further range of ways of working: subtle watercolours documenting travels by bus, to and from the west of Johannesburg, and materially physical pieces that became more ambitious in terms of scale. The latter processes resulted in her Martienssen Prize exhibition submission for 2010, a piece selected for the final show held at Museum Africa, Johannesburg. This Martienssen Prize piece seemed to encourage a series of questions for her paintings. They became larger and, gradually, more committed to a physicality of surface. The factory and machine references remained, but in a less obvious way. Rather than marking an end point, the third year body of work opened up a further trajectory for 2011 and the final year of study. The first floor Art House studio assigned to her and two other fourth year students became a space of testing, flexing and asserting her evolving project. Lecturers, students and visiting artists passed through this space as part of the ongoing conversation Wepener has accrued around her work. In her final year body of work, the gate, the barrier, the door, are present but in a seemingly more subdued, subsumed manner. Wepener becomes interested in the forms of “intimacy” that are before and after, or behind, these barriers. The paintings leave their conventional wall space and become the “walls”, the “barriers”, the “doors”. They direct and redirect, they block, they intervene and invite a different entry into, and engagement, with a space. There is something of an “architecture” of painting in these projects. Familiar spaces become less passive and instead invite moments of imagining differently. The Substation gallery door becomes the subject for a painting and is installed as a full scale surrogate in the gallery doorway and is judged one of the best works on the 2011 Martienssen Prize exhibition. The fourth year of the BA Fine Arts degree often takes on an importance that belies the many years that still lie ahead for a student in or outside the “artworld”. Wepener no doubt understands this, and she would, I am sure, further note how the body of work present in the Wits School of Arts foyer and in the Substation Gallery, as much as it marks something summative in her project, is the next point of entry for yet further investigation.